Whidbey Golf Club began to take shape in the fall of 1960 when a group of local golf enthusiasts began considering the project of building a course. 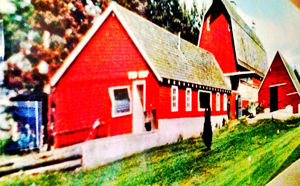 They acquired the Loerland Dairy Farm in May 1961 and the project began. The greens on the original nine holes were seeded in autumn of 1961. The fairways were seeded in the spring of 1962 and play began that year. The members of the Club began discussing the possibility of expanding the course to a full 18 holes in 1976 and after several years of work, the second nine opened for play in the spring of 1979. The dairy barn was converted into a clubhouse in 1962 and the calf barn converted into a pro shop. This conversion was done almost totally by volunteer labor of the members. Two cart barns were built in the 1980s. A fire on Halloween Night in 1996 destroyed the old clubhouse and pro shop. The decision to build a new clubhouse was on the agenda for the annual meeting the following week, but the fire decided the issue. The new clubhouse with a full-service restaurant and bar and a greatly improved pro shop were completed in June of 1998.